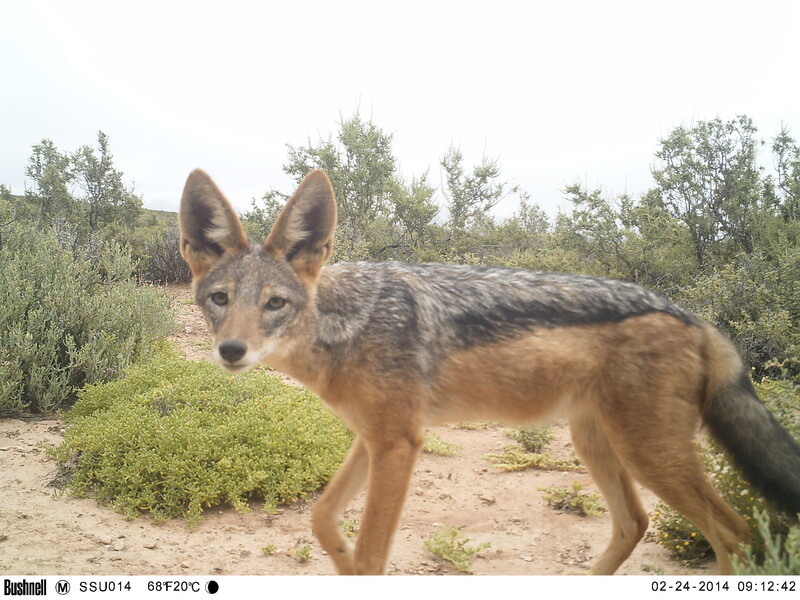 I am glad to share with you today a new publication in which the Karoo Predator Project took part recently about the phylogeny of African jackals. The research was led by Dr. Anagaw Atickem, Dr. Christian Roos and Dr. Dietmar Zinner from the German Primate Center (DPZ) in Germany. It was published in Zoologica Scripta under the title “Deep divergence among mitochondrial lineages in African jackals“. This study contributes to close the gap in our knowledge about the evolutionary history of canids by investigating the phylogenetic relationship between populations of African jackals Lupulella mesomelas and Lupulella adusta. And yes, as you have noticed, the black-backed jackal won’t be called Canis mesomelas anymore, but Lupulella mesomelas! But the most exciting and interesting point of the paper is that the two mesomelas populations, the one from southern Africa and the one from Eastern Africa, might in fact be two different species. More research is needed to conclude on that last point though. Recently, molecular analyses revealed that African and Eurasian golden jackals are distinct species. This finding suggests re-investigation of the phylogenetic relationships and taxonomy of other African members of the Canidae. Here, we provide a study on the phylogenetic relationship between populations of African jackals Lupulella mesomelas and L. adusta inferred from 962 bp of the mitochondrial cytochrome b (cytb) gene. As expected from its disjunct distribution, with one population in eastern Africa and the other one in southern Africa, we found two mitochondrial lineages within L. mesomelas, which diverged about 2.5 million years ago (Ma). In contrast, in L. adusta with its more continuous distribution in sub- Saharan Africa, we found only a shallower genetic diversification, with the exception of the West African population, which diverged around 1.4 Ma from the Central and East African populations. Both divergence ages are older than, for example the 1.1–0.9 million years between the grey wolf Canis lupus and the African golden wolf C. lupaster. One taxonomic implication of our findings might be that the two L. mesomelas populations warrant species status. However, genome-wide data with adequate geographical sampling are needed to substantiate our results. Camera trap picture of a young black-backed jackal on a farm in the Central Karoo. This entry was posted in Uncategorized and tagged Africa, Canis mesomelas, DPZ, jackal, karoo predator project, Lupulella mesomelas, phylogeny african jackals. Bookmark the permalink.